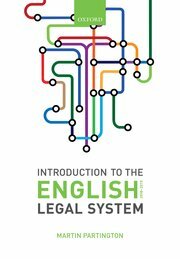 My book does what the title suggests: it offers an introductory account of the English legal system, how it has developed in recent years, and how it is likely to develop in future. But it is not simply a description of the institutions within which law is made and practised – for example Parliament or the courts. I want you to think about why law is important: what are the social purposes of law and does how the legal system relate to the ways in which society runs? I also want you to see how the legal system relates to some of the most difficult issues facing the modern world. (For example, how should the government’s need to protect civil liberties be balanced with its need to reduce the risks associated with terrorism?) And I want you to think about the transformation that the English Legal System is currently experiencing. Even readers of an introductory work on law come to the subject with a good deal of ‘knowledge’, shaped by what they have read or heard in the media. The problem is that much of what appears in the media about law is, at best misleading, at worst quite wrong. Therefore most people’s prior knowledge of law is incomplete. The importance of the general public being able to find out more about how law and the legal system work is essential. This is why the book is written without going into every last detail, but in what I hope is an accessible style. In writing the book, I address five images of law which many of you may have, but which are incorrect or misleading. Most media discussion of law and the legal system concentrates on what happens in criminal trial courts. This is understandable. It is there that the murders and other serious criminal cases (such as theft or fraud) are dealt with. The perception of the central place of the criminal justice system is reinforced by numerous television plays and films which draw on the inherent drama of the criminal trial. But such a view is far too narrow. First, as discussed in Chapter 5, the vast majority of criminal justice decisions are taken not in courts, but elsewhere, for example in the police station or by the Parole Board. Secondly, focusing on the criminal trial ignores the existence of other equally important parts of the English legal system—the civil justice, administrative justice, and family justice systems considered in Chapters 6 to 8. Media treatment of the question who provides legal services, focuses—again understandably—on professionally qualified lawyers. Again this is far too narrow a view. As shown in Chapter 9 (and part of Chapter 7), many others – not professionally qualified as lawyers – provide legal services to the public. In addition, media descriptions of lawyers are often very unflattering. Some paint them as cynical parasites, willing to undertake any task for which a client is willing to pay—the ‘hired gun’ model of the lawyer. Others highlight the salaries some lawyers are paid, which promotes the ‘fat cat’ image of the lawyer. Some portray lawyers as using their legal training and professional status to enhance their earnings by creating a mystique around the law which prevents ordinary people from making effective use of law—the lawyer as ‘freemason’. There may also be perceptions about the education, class background, gender, or ethnicity of lawyers which arise from media coverage. While there may be some truth in some of these perceptions, a more detailed look provides a picture that is both more complex and more interesting. The law and the legal system are sometimes portrayed as old-fashioned and backward looking. The Victorian architecture of law’s landmark buildings, such as the Old Bailey or the Royal Courts of Justice in London, seem to reflect a bygone age. So, too, do the robes that lawyers wear, particularly when appearing in court. Such images may lead to a more general impression of resistance to change. Many who practise law do resist change. It is disturbing and unsettling. But for many, change is what prevents life becoming boring. The last 30 or so years have witnessed a large number of changes in law and legal process, many of which have been very dramatic. The pace of change is currently breath-taking. Another of the themes explored in this book relates to the forces for change—the dynamism—within the law and the legal system. In Chapter 4 we consider the contribution of government to the pressure for change. Indeed, the current government’s approach to public expenditure is having significant impact on the legal system. Throughout the work, there are numerous examples of how practice and procedure have changed in recent years. Implicit in this discussion is a more fundamental question: should those who work in the legal system be more willing to proclaim change as an important part of our legal culture than has happened in the past? The media often suggest that legal proceedings suffer from inordinate delay and expense. This perception has driven much current debate about reform of the civil justice system, discussed in Chapter 8. It underlies many of the other changes made to the justice system. However, before concluding that the whole of the system is dogged by inefficiency, delay, and expense, we again need to consider the evidence carefully and ask how far popular images reflect the reality about the English legal system. We also need to ask whether pressure for greater speed and efficiency can sometimes act against the interests of justice. A final issue which dominates media treatment of law relates to miscarriages of justice. This may suggest that there are serious, even structural, defects with the legal system that result in these miscarriages. There is no doubt that from time to time things do go seriously wrong. Cases are improperly investigated, or inadequately presented in court, or inexpertly handled by the trial judge, or insufficiently considered on appeal. It is right that the media draw attention to them. But miscarriages of justice also demonstrate another side to the English legal system. Whatever the difficulties, there are those within the system willing to challenge decisions that have not been arrived at by due process of law. Many of those arguing that miscarriages of justice have occurred are themselves lawyers. Miscarriages of justice may lead some to perceive the legal system as a system in crisis. Paradoxically, though, they may also be a source of reassurance, that the system and those who work within it are sufficiently independent and robust to challenge those who have made mistakes. Where there is truth in those images and pre-conceptions, particularly negative ones, I hope readers can learn from the fact that not everything is perfect and reflect on what may need to be changed. Where images of law and the legal system are unfair, I hope readers will be better informed. All books – particularly law books – become fixed once they have gone to press. My blog is intended to help readers keep up to date with key developments. See further, about this blog; and dip into the posts that appear in the blog! I look forward to receiving any comments you may have. Although I’m quite new to the legal space, the issues, challenges and key developments in law to tackle current societal phenomenon such as balancing civil liberties with terrorism legislation makes for an interesting reading. A true balancing act to protect citizenry on one hand while delivering fair legal system will have to evolve with time. Look forward to reading more of your blogs!